Look at this little guy! Squat Urchin Shrimp are found in shallow, tropical ocean waters all over the world but, more importantly, each one lives in a miniature world all of their own. A world composed entirely of spines. Squat Urchin Shrimp are always found clinging to the spines of a local Sea Urchin, and they're quite picky about where exactly they'll set up home. In the Caribbean, they typically hang out on West Indian Sea Eggs (Tripneustes ventricosus), the related Collector Urchin (T. gratilla) is a constant friend throughout the Indo-Pacific while the Pebble-collector Urchin (Pseudoboletia indiana) is a favourite around Hawaii. 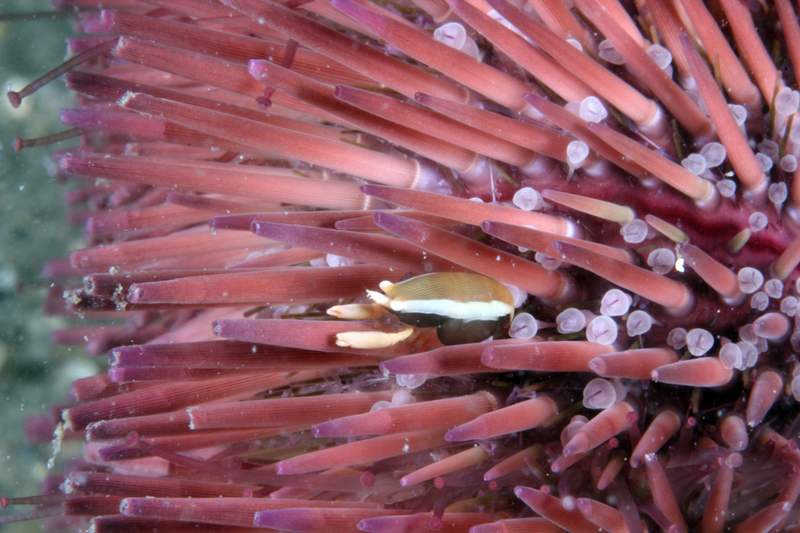 So while their standards are high, they're lucky enough to find many widespread Sea Urchins that fit the bill nicely. They're scarcely a hardship, either. Squat Urchin Shrimp are less than a centimetre (0.4 in) long and fit neatly into the narrow spaces between the spines. Equally tiny relatives like the stripy Bumblebee Shrimp wow aquarists with their delicate stripes but Squat Urchin Shrimp make do with just one, large stripe along their flanks. It serves to break up their outline and affords them some camouflage among the peculiar foliage. 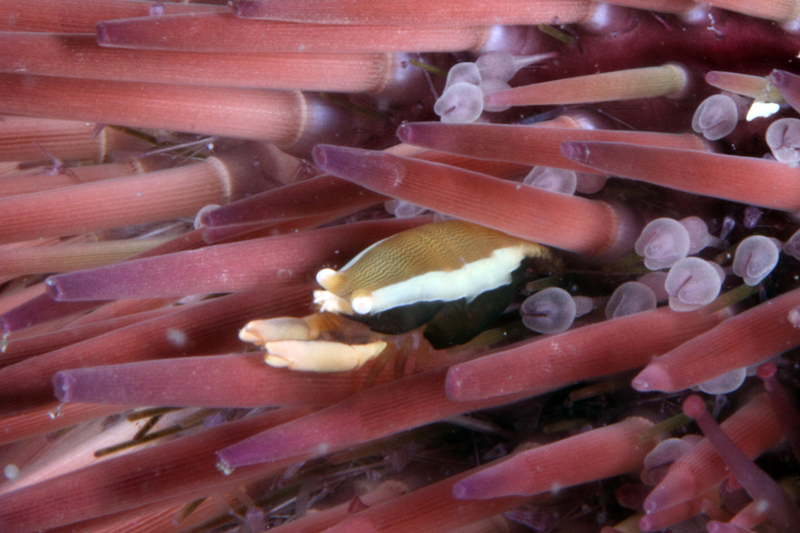 Hidden among the defences of their unpalatable host, Squat Urchin Shrimp have precious little reason to ever leave. They munch on the thin layer of skin which grows on those very same spines. Sounds nasty, but the skin grows back quickly enough that it's like one cow grazing on a field of grass. And they also eat bits of detritus that get caught up on the spines, so they're not all bad. Suqat Urchin Shrimp are citizens of their own spiny planets travelling through the vastness of the ocean floor. A passing fish is an unfathomable alien from realms unknown. Now that's what I call a small world! It was crazy how you wrote about urchins like they're the protagonist of some story! Lol.. what an I staying!! everyone IS a protagonist of their own story.! !